Between May 7 and 12, Florence is host to the European Festival with over 100 cultural events, shows and more to celebrate Europe. Among the events you should not miss out on: the Maggio Musicale Fiorentino performs Verdi’s Don Carlo on May 12 at 3:30pm while on May 11 at 8:30pm there will be a concert conducted by the great Zubin Metha. 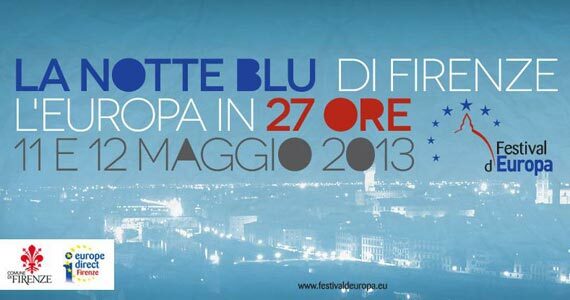 The Festival closes with a Blue Night that lasts 72 hours all across Florence, starting the morning of Saturday, May 11. The events are numerous so the difficulty is just in deciding what to see, where to go! The majority are within the historical center so that will make it easier to participate in several of them, even if they take place at around the same times. Whether you love classical, jazz, raggae or latin music, you will find something for all tastes. Piazza della Repubblica will be the center for musical events taking place over the weekend, although not the only one. For the occasion Piazza delle Repubblica will host the first edition of the Music Festival “Bleurock Experiment” on Saturday 11 ans Sunday 12 from 4pm. The festival is a good chance to listen Italian independent rock bands playing electronic, progressive, metal, funky music and much more. If you’re a music lover, don’t miss this event! On Saturday, May 11 you can head up Palazzo Vecchio’s tower called Arnolfo’s Tower all day, between 9am and 8pm. You do need to book so stop by to decide a time at which you can take part of the guided tours up the tower from which you’ll enjoy a wonderful view of Florence. Another event we recommend you do not miss takes place in Piazza Santo Spirito at 3:30pm, also on Saturday: over 1000 readers will divide up Dante’s Divine Comedy and read verses as the show “All’improvviso Dante” takes place. If you love historical reenactments, the Easyliving Beach on the Arno (Lungarno Serristori) will be the scene of a recreation of the fight between Charles VII and Pier Capponi on both Saturday and Sunday afternoons; see the flag throwers, musicians, parade in historical costume and much more! The Blue Night also offers many events specially dedicated for kids and families, including the reading of fairy tales at the Museo dei Ragazzi in Palazzo Vecchio for children 4 to 7 years old (Saturday from 10.30am to 3:30pm). Florence and the European Festival await!